Themes in the Historical Geography of France compiles several selected themes in the historical geography of France. 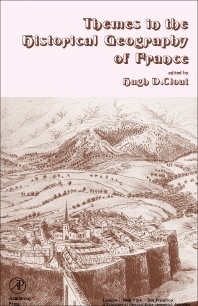 This book discusses the practice of historical geography in France; peopling and the origins of settlement; early urban development; and retreat of rural settlement. The regional contrasts in agrarian structure; reclamation of coastal marshland; petite culture on 1750-1850; and reclamation of wasteland during the 18th and 19th centuries are also elaborated. This compilation likewise covers the historical geography of Western France; urban growth on 1500-1900; and agricultural change and industrial development in the 18th and 19th centuries. This publication is beneficial to historians and geographers aiming to acquire knowledge of the historical geography of France. Did France Undergo an 'Agricultural Revolution'? Advance or Stagnation in French Agriculture After Mid-Century?